Do wish you could get more exercise? Do you miss working with your physical therapist but they say you don’t qualify for insurance coverage anymore? 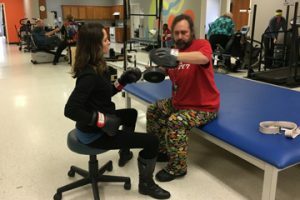 We have the class for you that will keep you fit and strong and progressing toward your rehabilitation goals! This exercise program can improve motor function (muscle strength, balance, walking), cardiovascular fitness, bone density, executive functions and memory. The stroke class can help to improve the physical and cognitive abilities of people living with a stroke, also help reduce the risk of secondary complications such as falls, fractures and heart disease. It is also a wonderful social opportunity to meet others that have the same struggles and same celebrations of success! Get moving and join us for a great class! To participate, contact us for your Free Fitness Assessment today!